Miniature Maven Diaries: 1/2 scale anyone? I have been saying for ages that I don't want to do a dollhouse. Too much time, not enough space! Recently I started to dream of building a 1/2 scale dollhouse. I posted on the yahoo Group Canada Minis, asking if anyone knew if 1/2 scale kits are ever available at our show and sale in September. Carol, a wonderfully generous member of our mini group, showed up to give me a ride to an estate sale a couple of weeks ago, and she had a 1/2 scale dollhouse kit that she offered to give me! I was very astounded at her generosity and very pleased. Carol didn't stop there. I bought mostly small items at the show and sale, lace trim, small grocery items. Carol saw several cute 1/2 scale items and insisted on buying them for me :) I was like a kid at Christmas. I think this will be an ongoing project for me, since I don't have the time and the money to do it very quickly! I have about 3 shadow boxes for friends or family that I want to do, and keep working on my Etsy shop. The 1/12 house comes assembled, with furniture, accessories, and a doll family. Someday... We all have our dollhouse dreams, don't we? Ruth, congratulations on your beautiful house. Enjoy it. It is a project you can work on very long. Hello Ruth! I hear that 1/2 scale is VERY ADDICTIVE! hahah Have fun getting hooked. Was the estate sale that you attended the one that Maureen (St. Albert Minis) helped organize? Maureen was showing her purchases from a recent estate sale a week or so ago, and so I wonder if it was the same one. Yes, it was the same sale! It was an amazing sale. I had some great finds and I could have jumped out of my skin I was so excited that Carol gave me that kit! I thought about writing a post and sharing everything I bought but last week was so crazy. I will post tonight or tomorrow with my latest pamper basket. Been working on those and designing miniature labels. The dollshouse is wonderful. I really like the structure. Enjoy! Thanks Faby! I like the structure too! Im so jealous, now I want a 1/2 scale house! :) have fun decorating it..those little baby houses can be addictive you might wind up with more than one. Go to the greenleaf website hun! 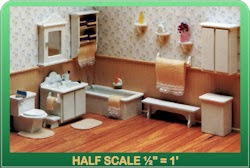 Click on store to see all of their 1/2 scale furniture kits. Almost all of their houses are now available in 1/2 scale. Carol from our mini group GAVE me the house. She said she no longer wanted it. She's been doing minis for 30 years and mostly works in 1:48 (quarter scale) now. Once I never thought I would do half scale, or quarter scale. Now I'm looking forward to doing both, eventually. I wish I could get by on 2 hours of sleep. Or clone myself. Too many mini projects, not enough time! What a delightful little kit, Ruth! I haven't tried half scale yet; I think I'm a bit intimidated by the furniture aspect of it. It looks like you have found some good selections for that. I'l looking forward to seeing what you do with your house! How cute! I hear from my customers that the best 1/2 scale furniture is in England. Have a great time with it. It sounds like you are going to be super busy for the next couple of months. I found a British website where the best deals are. Ironically, even though the pound is worth so much more than the dollar, it's cheaper for me to buy British than American because shipping is less expensive from the UK. There is one online dollhouse store in Canada that stocks Half Scale stuff, but the selection is pretty limited!